Introducing kids to sewing can be quite a productive summer activity! Sewing not only lets you mend and create beautiful pieces of winter wear , but it also improves concentration, precision, and hand-eye coordination. Why don’t you invite your kids’ friends for some weekend knitting classes and get them interested in this useful and enjoyable pastime? 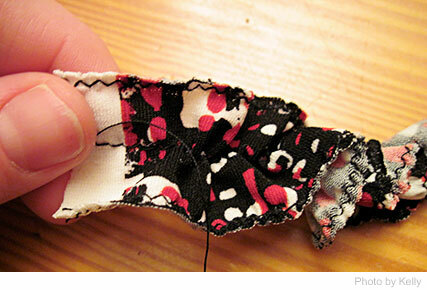 Here are a few tips on teaching kids how to sew. Start with teaching kids concepts instead of rules. This will help your child to better understand the process of sewing, instead of just following what you say without true comprehension. Basics of sewing – Explain that sewing is similar to gluing or pasting. The only difference is that you use needle and thread instead of glue to put together two pieces of cloth. Every time the needle is woven in and out of the fabric, stitches are formed that keep two pieces together. Basics of stitching – How tightly a fabric is stitched is determined by the length of its stitches. The shorter the stitches are, the tighter the seam is; the longer the stitches are, the looser the seam is. If you are planning to stuff cotton or some other material between the two layers of cloth, it is advisable to make shorter stitches. Layers – Cut out all the pieces that you are going to sew before you start stitching. Lay them out in layers so you can visualize how they’ll look when they are stitched – that way, you can make sure everything is the correct size. Always use a thread that matches the color of your fabric (unless you want to make the colors contrast intentionally). Sewing is so much fun! Encourage cooperation in your sewing class. If you are teaching how to sew shapes onto fabric, for example, one child can help you with a heart while the other can lend a hand in sewing a star. Another way to make sure the kids work together is to have the kids who have got the hang of sewing to help those that are having more trouble. This teaches them teamwork. 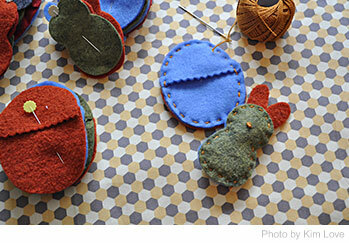 Use simple fabrics, supplies, shapes, and stuffing for beginners. Choose fabrics that don’t fray and that have edges cut in a straight line. Felt, flannel, and other knit fabrics make wonderful stitching material for this purpose. Use the correct needle size, and sew with threads such as standard sewing thread, embroidery floss, crochet thread, and lightweight twine. Instead of splurging on expensive stuffing, opt for fabric scraps, cotton balls, and the insides of a pillow - these are cheaper options, and better for inexperienced sewers. Begin with easy shapes such as squares, rounds, ovals, triangles, etc. instead of stars, polygons, animal figures, etc. Be patient with your child’s attention span. Sewing is a nuanced skill and kids will inevitably need time to master it. Some kids take almost 9 months, while some can learn it in as few as 3 months. Plan the classes over weekends and advise the kids to practice at home through the week. Stitching is a wonderful art, and we hope these simple sewing tips help you teach your kids and their friends this practical skill!